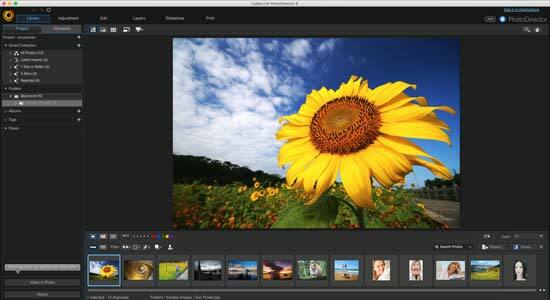 PhotoDirector 8 Ultra is a new photo-editing software from Cyberlink, which offers the ability to work with layers, filters, effects and so on. It is compatible with both Windows and Mac, and is also capable of reading a wide variety of proprietary raw formats. There are also over 100 lens profiles to provide correction options. You can download the software for £79.99, with the possibility to try a fully-functioning free trial for 30 days before committing to buy. 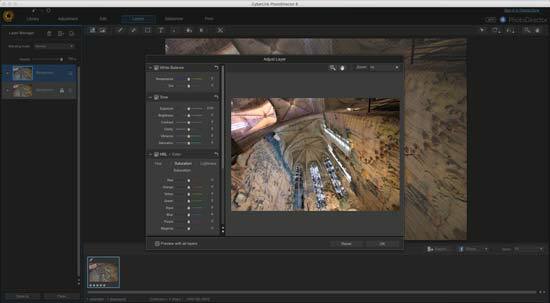 We installed PhotoDirector 8 Ultra on a Mac, which followed a very simple process. You download the software from the website, and if you have an activation code you enter it, or you can choose to run the 30-day free trial. As the trial is fully functional, it’s definitely recommended as you can use it exactly as you would once the software has been purchased. Using the software is organised into different tabs, which you can navigate between depending on what kind of editing you are doing. When you first open the software, you’ll see a number of example images displayed along the bottom, as you’ll automatically be in the “Library” tab. You could use these to experiment with, until you get to know Cyberlink PhotoDirector 8 Ultra a little better. 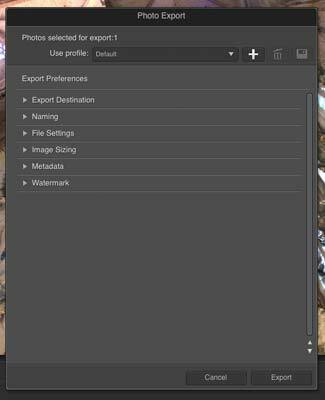 If you want to work on your own photos, you click the Import button, and you can select a single photo, a range of photos, or a whole folder. Once you’ve done that you’ll be able to see your own photos displayed along the bottom of the screen. The Library is a great place to organise your files as you can browse by different folders, albums, tags, faces, or give photos ratings and browse by that instead. Once you import a set of photos into a “project”, you can set about organising them how you see fit. Once you’ve chosen an image you want to work on, you can head to the Adjustment tab to start editing. Under this tab is where you’ll see all the different settings you’ll probably be used to seeing if you’ve ever worked with a piece of photo editing software before, such as Photoshop etc. There is a histogram displayed at the top, where it also shows you the settings you used to take the photo (i.e. ISO, aperture, shutter speed, exposure compensation and focal length). Just underneath the histogram, you’ll see “Regional Adjustment Tools”, which allow you to make changes to certain parts of the image, without changing the whole image. You can use tools such as spot removal, red-eye removal, but you can also use this area to make gradient masks, or use an adjustment brush to erase or brush in adjustments. Underneath the regional adjustment tools is the global adjustment tools - any changes that you make here will be applied to the entire image. There’s a lot of different options here, including White Balance, Tone, HDR Effect, Saturation, Toning and so on. You make any changes by moving sliders - pretty much anything you might want to change is available here. You can make as many or as few changes as you like, and there’s also a curve tab. Any of the tabs which you’re not using, you can minimise to tidy up the interface as much you need it to be. One of the most useful tabs is Auto Lens Correction. This should be automatically populated with whichever lens you’ve been using, applying correction for distortion and so on as per the presets that come with the software. 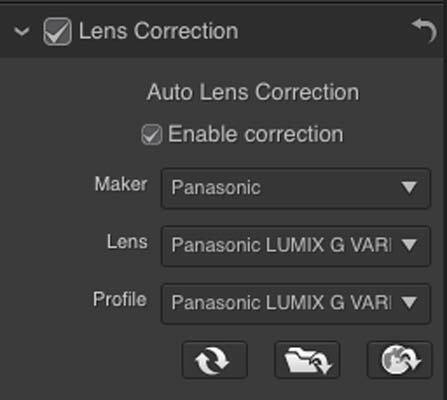 You can tweak lens correction as well, again using the sliders underneath, and you can also import lens correction profiles. When you make any changes, they will appear in the Cyberlink PhotoDirector 8 Ultra main window, applied to the image as you make them. If you’re a beginner, or perhaps you just want to have a bit of fun, you’ll also find a range of Presets which you can use. You’ll find these in the Adjustment window, just next to the manual tab. Here you’ll find all kinds of presets split into different categories, such as Black and White, Scenery and Style. You can also download presets which you can use, as well as create your own to use at a different time. That’s useful if you often want to create a certain look, but don’t want to create it from scratch. While you are in the Adjustment (or the Edit) window, the main window also has some options which you can change. You can zoom in and out of the image you’re working on, show the image full screen, or handily, if you have a second screen, choose to show the image on your other screen, while keeping the main editing window open. Another particularly handy feature is the ability to show a side by side view of before and after of your editing work. This helps you to quickly see what you’ve done, and how the finished image looks different. You can also bring up a list of changes so that you can go back to any point in your editing process, rather than having to start from scratch, or to laboriously keep pressing undo if the point you want to go back to is a few changes ago. Once you’ve finished any adjustments you want to make, the next step is to go to the Edit tab (as recommended by Cyberlink in a pop-up when you first start moving between tabs). 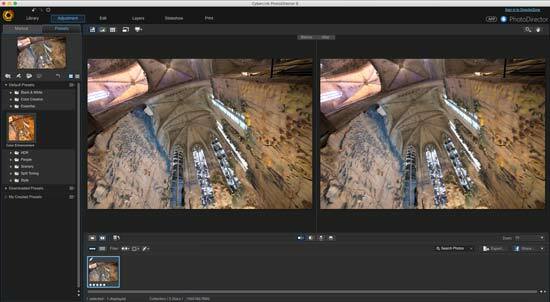 It’s here that you’ll find some of the more fun editing tools, such as effects, or object removal. You can also find some of the video options which allow you to create multiple exposures from videos, or create a panorama from a video you’ve recorded. You’ll also find that you can create watermarks, frames and so on under this palette. The next recommended step once you’ve finished in that tab is to go to the Layers area. You’ll now see that you can no longer view your image side by side in a before and after, and options such as the long list of editing changes will have disappeared. 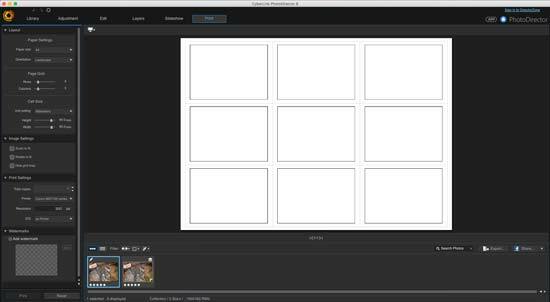 You can now however create layers, including empty layers, photo layers, and duplicate layers. You’ll see all the existing layers to the left hand side as you’re going along, and you can switch any layer off at any time by clicking an eye icon next to it. There’s also Blending modes, where you’ll find options such as Darken, Overlay, Exclusion and so on. When you create a new layer, you can adjust it. This allows you to make changes to things such as saturation, white balance and so on, but there’s a far more limited range that what you’ll find under the “Adjustment” tab. In this mode you can also do things such as add text, draw shapes, and use the fill tool. The final two tabs in the main window are Slideshow and Print. These are pretty much self-explanatory - you can use the first to create a slideshow of your imported images, with a range of different effects, ratios and with background music. 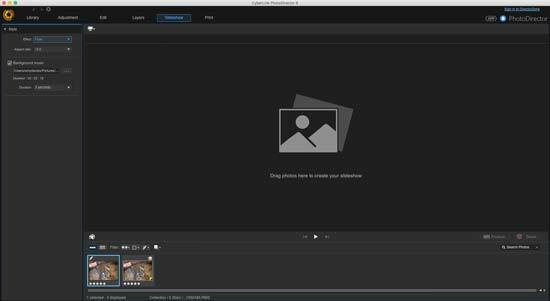 There’s quite a lot to get to grips with in Cyberlink PhotoDirector 8 Ultra, but you can make it as complicated or as simple as you want to, depending on how much editing you want to do. It’s worth exploring the different tabs and the different options to get to grips with how it all works. There’s tutorials and lessons also available on the Cyberlink website which will help you get the most of the software. Once you’re ready to save your image, go to File > Export and you’ll be given lots of options of how to save your image. 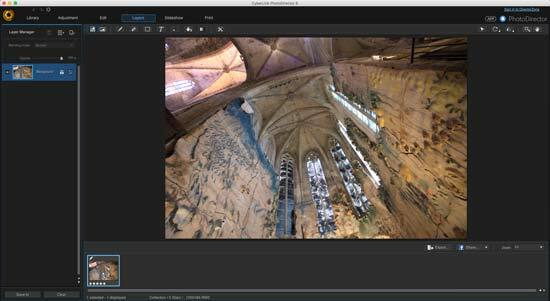 You can choose the destination where to save it, along with choosing a file name, or naming convention, file settings, image sizing, metadata and watermarking. If you are working on more than one photo at a time, say from a set of images, you can save them all together with the same settings and naming conventions for ease and speed.